Jazziz Magazine hailed her as a "Voice of the New Jazz Culture...amazingly powerful with seemingly limitless expression. In her career, Ms. 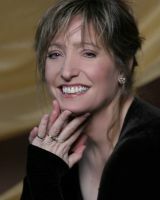 Planet has performed with legends such as Jackie and Roy, George Benson, and her mentor Nancy King, and shared the stage with many other accomplished jazz artists including Ellis Marsalis, John Harmon, Gene Bertoncini, and Marian McPartland. Janet is also on the staff of the Tritone Jazz Camp and teaches voice privately as well as conducting clinics. Janet Planet has been paying her dues and studying the craft of singing for over two decades, steadily building a career that began with a high school talent show performance. Her 1985 Seabreeze release, Sweet Thunder brought Janet to the attention of Steve Allen who wrote, "There are so many dumb and inarticulate singers today”. It’s a pleasure to hear someone who knows what singing is all about. As the past century closed and a new one began, music critics have noted her arrival as an accomplished artist. While technique sometimes gets in the way of creative jazz singing, Planet employs her faultless technique to the service of phrase and text. Janet Planet is now almost certainly the best of today’s jazz singers, but even more, she'd earn a high standing in any age, said Erik Eriksson. Producer, recording artist, for numerous years Janet has served as a session artist. She co-founded Stellar Sound Productions in 1995, a recording label that has consistently earned praise from reviewers for both exceptional artistic content and high production values. Active in all aspects of the recording business, she owns and operates Steel Moon Recording Studio with her husband, saxophonist/composer, Tom Washatka. Janet's most recent release is an album of Bob Dylan songs. Janet Planet Sings the Bob Dylan Songbook Vol. 1 features thirteen of Mr. Dylan’s compositions from the 1960s. Ms. Planet is most influenced by lyrics, and in constant quest to connect the meaning, physicality and musicality of words. Like many other jazz and cabaret singers, Janet Planet has drawn from the American Songbook for material, but as an artist, she is continually reaching beyond traditional boundaries for inspiration. Janet was drawn to the concept of a Dylan Songbook for not only the poetic value of Dylan’s work but also for the musical challenge, his melodies posed for a jazz musician. Planet reflects, "I am a lover of words. Bob’s prose inspired me to sing his songbook. As it turns out, I became a legitimate Dylan fan only after I tackled, articulated and assimilated his words... wrestled with, tampered with, and slept with his words." As an extension of this new CD, Janet has produced big band arrangements for this music. The arrangements were designed to be accessible and not too difficult to play. From belting the blues to ethereal interpretations and from jump swing to traditional folk storytelling, Janet offer a program that is dynamic and engaging. Arrangers that contributed to this project include: Grammy nominee, composer/arranger and Chair of Jazz Improvisational Music at Lawrence University Conservatory of Music in Appleton WI Fred Sturm, top improvising cellist/arranger Matt Turner (who also arranges for Alfred music, Carl Fischer Music and Lathen Lorenz Publishing Co.), and award winning arranger/saxophonist Tom Washatka. The result is a book of 13 charts that can be performed by music students to veteran jazz musicians. High school, college, and professional players can present this music, bringing Bob Dylan to jazz lovers and jazz lovers to Bob Dylan's poetry.